Ubisoft surprised gamers a bit when it announced Far Cry New Dawn at The Game Awards 2018, a new installment in the open world first-person shooter franchise due for release less than a year after Far Cry 5. Far Cry New Dawn is set seventeen years after the game’s post-apocalyptic ending. The community of Hope County is trying to rebuild itself, but the Highwaymen gang led by twin sisters Lou and Mickey are of a very different mind. In an interview appeared in the latest Official PlayStation Magazine (February 2019, issue 158), Ubisoft Montreal’s Creative Director Jean-Sébastien Decant talked a bit about the two new villains. It’s super-interesting to try and find new, fresh takes each time and it’s been a while that we were toying with the idea of having a female villain. And at the same time, on my end, after working on a number of Far Cry games I was really looking for a way to change the dynamic of the moments you spend with the villain. We had a lot of [one-on-one encounters] so could we have something where there are two characters that are straight in your face? And the idea of two siblings, you know? They have their own world and you get into that world. That was the initial starting point. You’re going to love to hate [them]. The developers of Far Cry have set a high bar when it comes to villains, though, not just with Far Cry 5’s Joseph ‘The Father’ Seed but also with Far Cry 4’s Pagan Min and with Far Cry 3’s Vaas Montenegro. 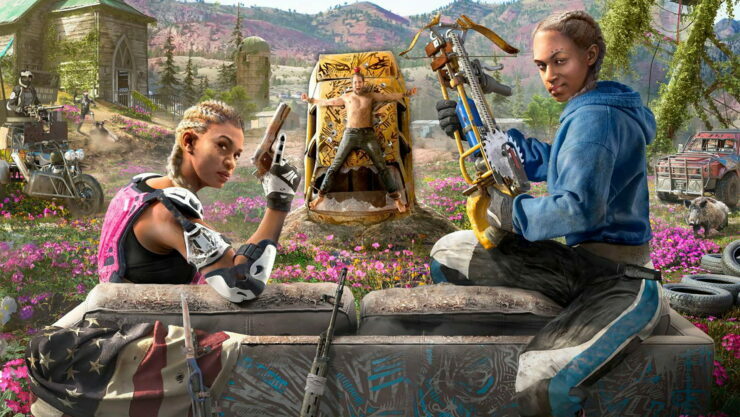 It’s not long until we’ll know whether Far Cry New Dawn’s Lou and Mickey can be just as iconic, as the game is due February 15th on PC, PlayStation 4 and Xbox One; we’ll have a hands-on preview up later this week.